The following posts highlight current projects that are either in the design phase or under construction. A new project has broken ground! This amazing project is a two level terrace that overlooks the 9th fairway of Sedgefield Country Club. There will be amazing views of the Wyndham Tournament as players hit their approach shots into the green. The project highlights are an upper level covered dining space that flows from the existing kitchen. It will have a gourmet outdoor kitchen as well as an intimate fireplace. The lower level will be an extension of the finished basement/game room and will have a bar island as well as a wood burning fireplace. The lower level expands out to an open terrace with a fountain water feature. Watch for more updates as it progresses! 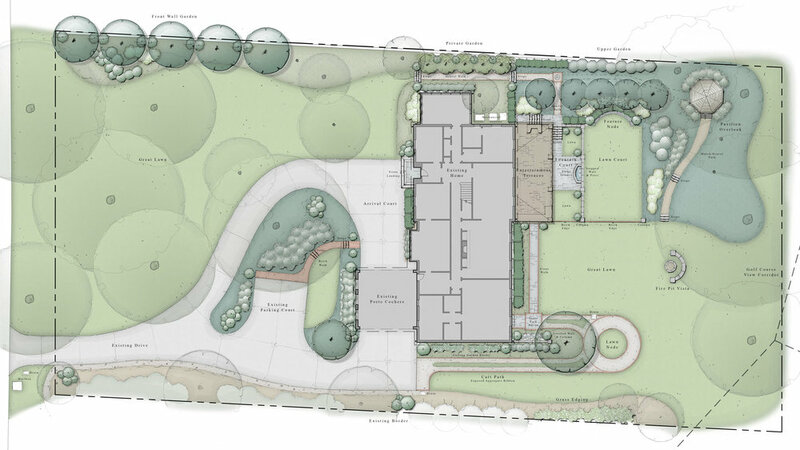 Brent Skelton Site Design is a landscape architecture studio in Greensboro, North Carolina focused on creating outdoor spaces that can be fully enjoyed functionally and aesthetically. With a dedication to the timeless fundamentals of classic landscape design and theory, Brent Skelton Site Design strives to produce designs that are inspiring, beautiful and enduring. Whether it is a residential estate or a commercial site plan, BSSD brings the same design principles to each new commision.